Skewered Curry Meatballs are called Curry Hackfleischbällchen in Germany. The meatballs are ideal for parties. To make a nice centerpiece for your table, stick the skewered meatballs into a pineapple and you have an edible decoration that looks like a hedgehog. Soak your French roll in the warm water. 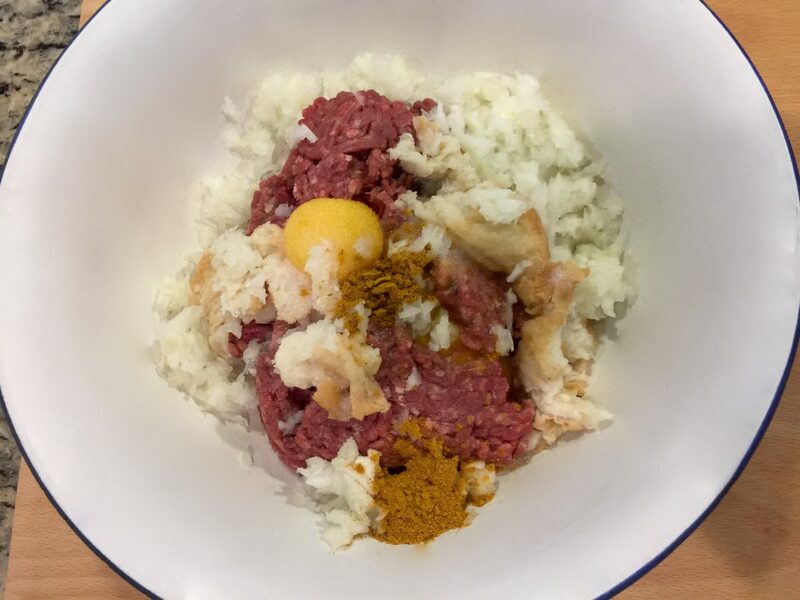 Place the ground beef in a bowl and add the diced onions, egg yolk, salt, and curry. Remove the French roll from the water and squeeze out any remaining liquid with your hands. Add the soaked bread to the ground beef. Mix all the ingredients together with your hands. Heat enough oil in a pan to cover the meatballs. Make sure that your oil is not too hot, about medium high (depending on your stove). 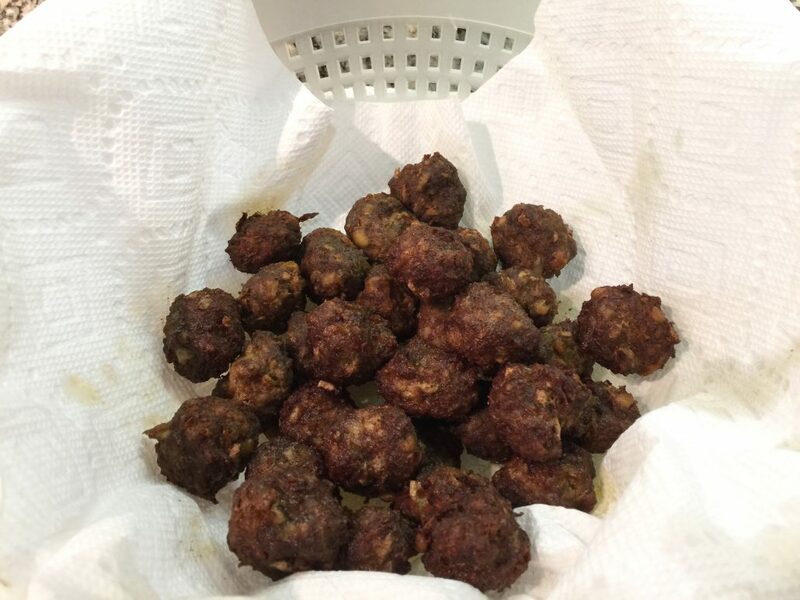 Use a tablespoon to form your meatballs (about 1 inch in diameter). Place them in the oil and let them fry for about 4 minutes. (If you have a fry basket or a spider strainer place them in the basket first for easy removal). 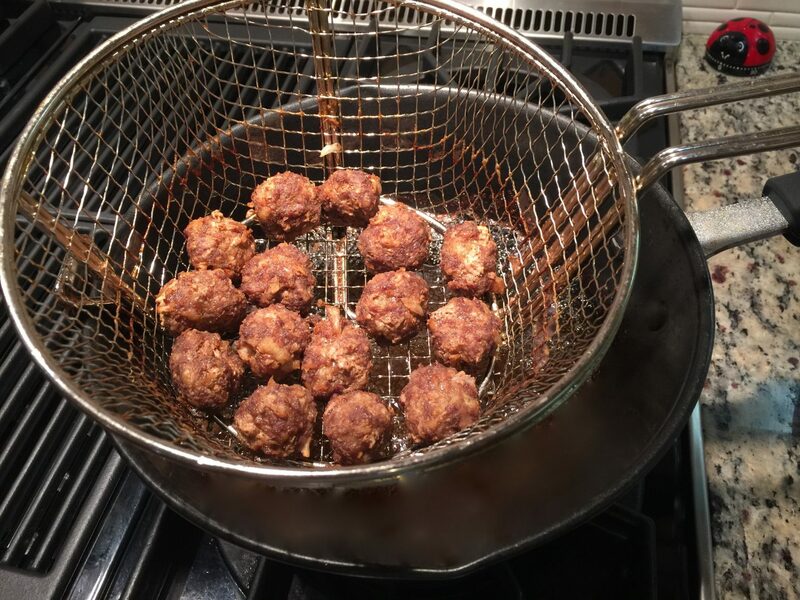 When done, remove the curry meatballs and place them in a colander covered with a paper kitchen towel. Inspired by the spikes of a hedgehog, start by rinsing the pineapple and drying it. Cut the cheese into cubes. Wash and dry the grapes and the tomatoes. Remove the pickles from the jar and drain them. Use wooden skewers and stick the fruit, curry meatballs, and cheese on the skewers in various combinations. Leave a little space at the bottom of the skewer, so that you can stick them into the pineapple. You should also leave a little space on the top of the skewer, so that it can easily be pulled out. Create your hedgehog display any way you like. Have fun!